A little thing about shopping carts. A tragic accident happened yesterday. *sniff* *gulp* I was hot-footing after K in Lowe’s last night, reminding him to please slow down. You see, even after all this time together with each other, he will sometimes forget that I’m slower than he is. “What?! ?” You ask. I know, I know. I’m stunned by that revelation myself but it’s true. K “needed” more garden supplies. I swear for a man who originally didn’t want a yard when we were house shopping years ago, he sure has taken up gardening as if it’s a lifeline. Honestly, it can be and has been. Even though it’s a lot of work, there’s a lot of joy and even a bit of escapism to it. He’s made our yard it our little project that is never finished and that’s ok because we love every change we bring to it each year. Now, back to Lowe’s. Right. Where was I? Ok I remember. “Slow down,” and he turns around to look back at me while turning the cart filled with bags of dirt. “K, I’m not made for this speed anymore.” I smiled at him and that’s when my life goes into slow motion. I see K about to say something and then I caught something flying out of the corner of my eye. Have you ever experienced something happening that you knew wasn’t right but you weren’t in the position to stop it from happening? Well, that was K and I. I was too far away and K was still looking at me when the dirt shifted in the cart that he was still pushing around a corner. There wasn’t a darn thing we could do. My portable liquid oxygen tank got squeezed out of the cart’s seat and flew out and smacked the concrete floor. The plastic casing came wide open and top was tilted out way wrong. Oh crude buckets! I gently picked it up, trying to squeeze it back together, when my mind was wondering if these things blowup. Apparently not this time. However, K’s first thought was, “Is it still flowing oxygen?” Isn’t he so sweet??? Miraculously, the darn thing was still working but I asked him what her would do if it didn’t. He said, “We’d figure it out. We always do.” What a guy, right? It wasn’t until we got back to home that we tossed around some ideas of what to do in that scenario. It’s always good to have a plan in place for such things because I can not be without oxygen for very long before I start to suffer badly and that’s if I’m just sitting somewhere without talking or moving to conserve my body’s oxygen supply. When we got home we discussed what we could have done if my portable had stopped working. I’m a little nervous to tell my oxygen provider that my portable is broken. But hey, these things happen, right? A lesson has been learned here for us. We will never forget to strap in my portable tank using the child safety belt in the shopping cart. I mean, we took the time to connect it through my purse strap but didn’t do it this time for my portable. A good friend of mine wrote this poem and it really spoke to me. It’s about a topic that isn’t talked about enough. Please read this poem and then I’ll begin to outline my experience with this subject. What else could take that place? That has been where you have stood. Let me take you back to when I was nearly 15 years old and had just underwent a surgery that would change the course of my life forever. It was the most traumatic experience I have ever experienced in my life that left me with some deep emotional scars. The surgery I had, brought me so close to dying that even the doctor was freaking out (professionally, of course). He allowed my sisters, my parents, and my grandmother to come into the ICU two at a time to sit next to my bed for as long as they could bear to. I was a mess. My older sister was so upset that she started crying and had to leave the ICU. Her boyfriend stayed with me holding my hand. My little sister came in with our grandmother. I was so hot from breathing so hard that the doctor relented and allowed a fan to be placed pointed directly at me to attempt to keep me cool. I had a tube up my nose and down my throat to my stomach to pump out the flow of black bile that I was continuously vomiting up. I was dying and everyone knew it. Yet, I struggled to hold on. When my little sister came in, and sat next to my grandma, she suffered quietly as she was always so sensitive to being cold. She sat in the direct path of my fan which was on its highest fan speed. I looked at her through the bed rail and I felt so bad for her. My heart rate was up to 200 bpm and I was sweating. I couldn’t turn it off for her. So, I did the only thing I could think of… I gave her my bed sheet for her to shield herself from the fan. I will never forget the look on each of my family members’ face as they came to sit with me. There’s so much more to this story but I’ll leave it for another time. I just want you to remember this moment as I jump you forward a few years to when I was nearly 17 years old. Life for me changed radically when I was nearing 17 years old. I started having blackouts. I wrecked my car numerous time due to blackouts, I tried working while I went to high school which made me continuously tired. I became hypoxic, forgetting homework assignments and where my classes were within the school. My psychology class assignment was to write an autobiography which pulled me so deep into depression that I would lock myself in the bathroom and cry. I started dropping classes that I didn’t need credit for to graduate because I was so tired and I was going to fail them. With all of this going on, my parents had been divorced for about 3 to 6 months and we ended up moving outside my school district. We had to drive ourselves to school everyday instead of switching school which I do not think I could handle. And then…. I got sick. Really sick. Pneumonia. I was so sick that I was carted off in an ambulance from my mom’s house to the hospital in the middle of a snow storm and stayed for 2 1/2 weeks making me even further behind in school. I had incompletes, Ds and an F on my report card with so many absent days reported that I remember thinking that there was NO WAY I was going to graduate from High School since this was my Senior Year. Plus, I had to quit my job. Among all of that, my doctors realized that I needed supplemental oxygen at home at night. Everyday I thought about killing myself. Every. Single. Day. I doubt even my best friend knew I was thinking about suicide. So, I come home from a second hospital stay from rebound pneumonia and started my attempt to catch up on my school work. I couldn’t do it because I was such a mess. My mother came into my room to ask me if she needed to find some help for me. That’s all she asked and when I said, “No, I can handle my problems,” she didn’t ask anymore. When I was like this, I closed myself off, became quiet, because any more added pressure would have been just too much for me to handle. I kept thinking back to the last surgery I had and the looks of my family and KNEW that I could never try to kill myself no matter how much I thought about it. I couldn’t do that to them. I didn’t think anyone noticed the turmoil that was going on inside me. Trying to deal with health issues, trying to graduate high school, dealing with a dysfunctional family life and more. I did graduate. My teachers passed me through due to my effort of trying. We moved to Texas. Slowly my life started to change once I picked up an old Pentax camera, took long walks (finding a Pecan tree! ), and learning to cook a few things for myself. I spent nearly a year just finding myself. Getting use to having my lungs needing supplemental nightly oxygen and learning to accept the future changes that will come. I know life will be ok for me but every-now-and-then I think of that surgery that very nearly ended my life. If I could survive THAT, then I could most likely handle the rest of this mess in my life. But, not everyone can, there are people out there truly struggling thinking that the only way out is through suicide. That’s not the answer. Getting help is the first step to finding your way through whatever life has thrown at you. Find a school nurse or counselor, a pastor of a church, a close friend or call one of the hotlines listed below and tell someone what’s going on that’s making you feel this way. Do it today. Thanks to Lifeline Website, you can find information about what to expect when calling the Hotline. In the USA: you can call the National Suicide Prevention Lifeline free from anywhere at 1-800-273-TALK. In the UK: you can call the Samaritans anytime, 24 hours a day, 7 days a week, on 08457 90 90 90. In Scotland: you can call the Breathing Space phoneline, which is available 24 hours at weekends (6pm Friday – 6am Monday), and 6pm – 2am on weekdays (Monday – Thursday), on 0800 83 85 87. Hello, my name is Christine. I use oxygen 24/7 and I am now 48 years old. I didn’t always have to use oxygen. It all began when I was 17 years old. It was a monumental change in my life. Since I was just a teenager at the time, it hit me hard. I’m hoping with this blog that people who also use oxygen can see that life isn’t over just because you need oxygen. I think the hardest part for me was accepting that I’ll never live without it again. Once I jumped over that hurdle, life began to change. For the good. 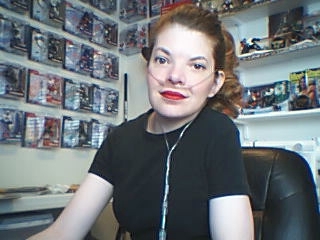 So with this blog… and for all those who are interested in knowing how I live with oxygen needs, I’ll post what I know in hopes that it will help others. Spouses & families too! I am married and what I’ve gone through since I was 19 years old, he’s gone through too with me. Each comment posted is reviewed for spam prior to possible posting. If you want to follow this blog, please sign up for email notification for each post I make. Look to the top of the right column of the blog to sign up.